The yard is due to close on the 15th of March, in a move that will be a hammer blow to the North Devon community and to English shipbuilding its 200 strong workforce. Transport Secretary Chris Grayling told the BBC he would make no apologies for “supporting a new British business”. The contract award notice states this was due to “a situation of extreme urgency” in the run-up to the UK’s EU departure date. Do our Government even know where Appledore Is ? What a mess. The last Shipyard in England to build whole Warships. Yes CPW, they do….they think that it is on the Belgian coast…somewhere near Dunkirk!!! I don’t always agree with the GMB but this time they have it right. It’s write to MP time again. Only takes ten minutes and it makes me feel better if nothing else! Do you ever get replys from MPs? I was wanting to go see my MP about a proposal for the huge old ardesier oil rig building yard with a business man soon I’m just waiting for an email reply. But does writing get an actual reply from an MP then? I’ve had several replies to e-mails from MPs. Some of them are printable! But don’t hold your breath. The longest I have experienced is when one of my students contacted Diane Abbot….she didn’t reply!! They write to me more now that I write to them with their fancy embossed letter heads. Always to tell me they have not managed to lower the tax on air duty I was asking them to change about 6 years ago, I just fly out of Dublin now instead. I have never had a response from my MP but have had responses from a Prime Minister and the MOD. You need to write to the PM to get a response I believe. I’m no stranger to writing to my M.P., and I usually get a reply by e mail. I often write emails to my MP & usually get a reply. Sometimes it seems a considered response, sometimes he just disgrees(which is fine as it’s a free country) & often I get a government spound bite response. You can never know what, if any, effect it may have but it’s better to try than not. When events burst the bubble of faulty policy, they may recall your suggestions & entertain them more readily if well thought out. Always be polite & as respectful as you can manage. i send a letter a week to my M.P for forwarding to the M.O.D HE NOW CALLS ME ‘ADMIRAL!!!! Scillonian III is a lovely little ship. Little gem. 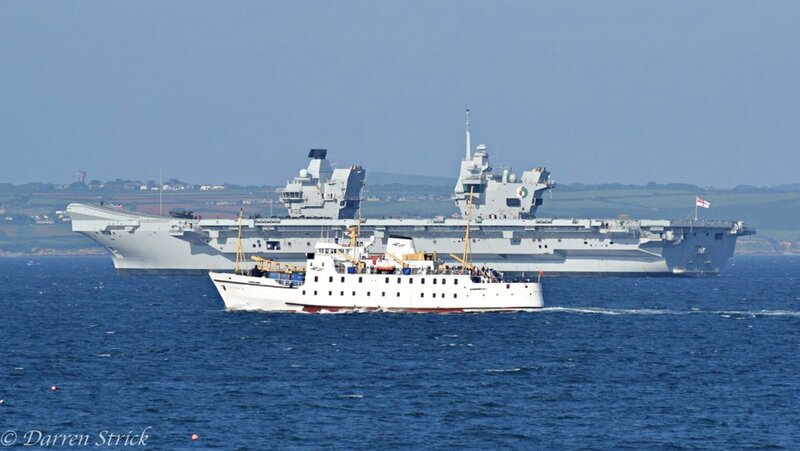 Nice pic’ of Scillonian III and another ship. Not very good memories of the old girl for me; several hours of spewing. She has excellent sea keeping qualities, unfortunately, I don’t! Any idea where that pic was taken? That was a nice pic Steve.??? The current Scillionian is a horrible ship to sale on if there’s swell, because its flat bottomed. Do not use the lower deck to have a look around!! It was like a scene from the exorcist – nuff said. We should say Isles of Scilly ferry rather than Scilly Isles ferry. This is the preferred description for local people. Didn’t the government already offer Babcock 61m worth of work? Babcock turned it down not sure what offering another contract will do and a ferry is likely to be around the same value if the owners of the yard don’t want it there’s little the government can do. Sounds like potential new owners want to diversify into other steel fabrication but union wants to negotiate on this. Would a SWATH ship provide a smoother ride for passengers? Yes. Initial purchase cost would be a problem. Pilot vessel Elbe belong to Elbe Pilot Association cost 50 million Euros in 2011. She is 60m long with a beam of 24.6m. Cornwall County Council has a budget of about £18 million for Scillonian IV. Would an X-Bow be cheaper? They should definitely do this. Also, we need more River class O.P.V.s to patrol our E.E.Z., France, Spain and Italy all have more O.P.V.s than us with shorter coastline lengths, the government should order another 2 of these inexpensive vessels and give Appledore the work. I think it high folly to keep closing down what little military infrastructure we have left. Appledore should be saved. How much more costly in time & lives in addition to finances, to rebuild airbases & shipbuilders etc rather than at least mothball what little remains in excess of current needs. The less defence in depth we have, the less our conventional deterrence & the easier it would be to defeat us or push us to nuclear. Peace never lasts forever. So what s the long term plan, how are the owners and unions going to ensure they win more order otherwise a few years down the road its the same story. Sir John Parkers report highlights need for change, changes in working practices and digital technologies. My fear is there’s no plan and we’ll see calls for the same cash injection a few years from now with the government again being blamed. Anyone who thinks handing an order to any company means it automatically has a long term future is sadly mistaken, normally its a costly stay of execution.